Suppose I told you that my wife, my three children and I, voluntarily climbed atop the roof of our car and sat there while a complete stranger drove the vehicle full speed, in and out of traffic, on the highway. Now, replace “car” with “raft” and “highway” with “whitewater rapids,” and you’ll have some idea of how we spent the scariest three hours of our vacation in Maine last week (see photo). I have to confess, it was partly my fault. I’ll tell you how bad. It’s 4 on a 5-point scale. In any case, by the time I realized what was happening, we were in the boat and the first rapid was upon us. Sensing danger, I quickly flashed back to my comprehensive white-water training course – 10 minutes sitting on a picnic table that morning, while some guy with more body hair than I’ve ever seen on a single human (I’m assuming) brought us up to speed. When you’re told to paddle, PADDLE!! And so paddle we did, going forward, backward, left, right, and resting – all on his command. I never understood when or why (I suppose it might have helped if I had opened my eyes); I just waited for the next command and did what I could. Now that was interesting – and counterintuitive. It’s not so much the speed or bumpiness of the water that’s the problem. It’s losing control. Evan a Class 2 rapid can hurt you, apparently, if you don’t take deliberate action to steer the boat. Raft. Whatever. 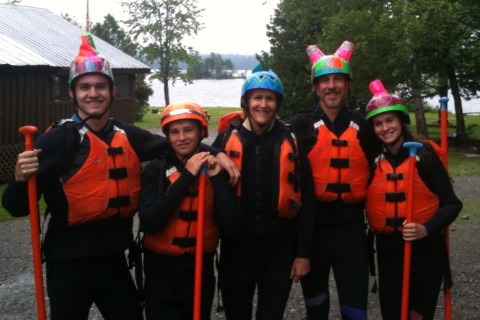 It seems to me that working as a solo professional is a lot like rafting through the rapids. There’s a fair amount of danger, uncertainty and surprise. And, maybe most of all, there’s a tendency to be distracted by speed and to forget that what really matters is control. The biggest difference between working for yourself and working for someone else – whether in a two-person company or a two-thousand person company – is control. When you work alone, it’s up to you to steer. Sure, people with jobs need to work hard, be efficient, coordinate their efforts with coworkers, etc. But that’s mostly about paddling – someone else (generally) is calling out the commands. As a solo, therefore, you need to pick your head up (often) and make sure you’re on a path that makes sense. It doesn’t mean you can’t take risks – taking risks is a lot of what makes being a solo professional fun and often profitable. But it does mean that activity, action, speed, effort … paddling, for its own sake, can be a colossal waste of time if you’re moving in the wrong direction. So here’s what I recommend. Find a way to stop what you’re doing, at least once a month, and make sure that you’re (at least mostly) on track. Spend half a day out of the office; read things that have nothing to do with your industry; join a group of energetic peers (here’s a good one) and help each other be smart together. Whatever works for you. Is your ancient web site hurting you? Is all that social media time helping you? Are your prices too low? Are your service descriptions incomprehensible? Have you lost touch with clients, colleagues and others who might refer work to you? You get the idea. None of this stuff has anything to do with working harder or longer or even more efficiently. It’s all about moving in the right direction. Because as Mr. Sasquatch observed, losing control is when it gets really dangerous. Yeti Man is Mr. Sasquatch! I always wondered what the difference between them was. Thanks for sharing your first-hand encounter lol. How to build real-world relationships in niches where networking events are sparse? I’ve found it especially hard in professional services niches selling more to other businesses. I think the key is always in figuring out where the people within the niche you focus on congregate. If they don’t do it in person (networking events), are there linkedin groups, things they read, etc. And, if you yourself create content that’s of value to them, you attract them as well. One of the reasons choosing a niche is helpful, is that the people within it – attorneys, coaches, copywriters, whatever – tend to congregate, either in person or virtually, as a group. What do you think? Yep, Michael, agreed for sure. I’ve been wanting to pick a niche for awhile, but that’s where I’ve spun my wheels in the mud. While I’m an introvert desk jockey Clark Kent type by day, I’ve found it helpful to don the courage cape to have real face-to-face conversations (or at least phone) by night. Somehow I always learn more that way. I see my newly minted lawyer brother going to 1 or 2 events a week, learning hugely, and creating great relationships. The Internet has been great for me in many ways, but it does get lonely, partly because it’s been much harder to get the same depth of conversation as offline. So I’d love to pick a niche that gives me enough offline interaction… before Yeti Man grabs me for a Class 5 river ride. I agree, Sunni. I’m kind of the same way and getting out and meeting people in person definitely gives me a charge. In my case, most of the people I meet with (for coffee or whatever) and not necessarily prospects. In other words, you might be able to get the “human interaction” energy you’re looking for by getting together with peers, even if the client networking is necessarily done another way. Keep me posted on how it’s going! Good point, Michael. Peer pow-wows (actually just had a 2-hour mastermindy one yesterday) sure do help. Still looking for the magic mix, but yeah… I’ll keep at it and keep you posted. Meanwhile, I hugely appreciate your thoughtfulness to reply and share your experience. Great newsletter. But isn’t it also true, that sometimes, you just have to keep paddling to keep your head above water! Goes to the old axiom….doesn’t have to be a big task (in marketing your business) , just do something! !